Alder is a loosely fitted sleeveless shirt dress with two options. View A falls into an A-Line at the waist and features a curved hem, bust darts and two breast pockets. 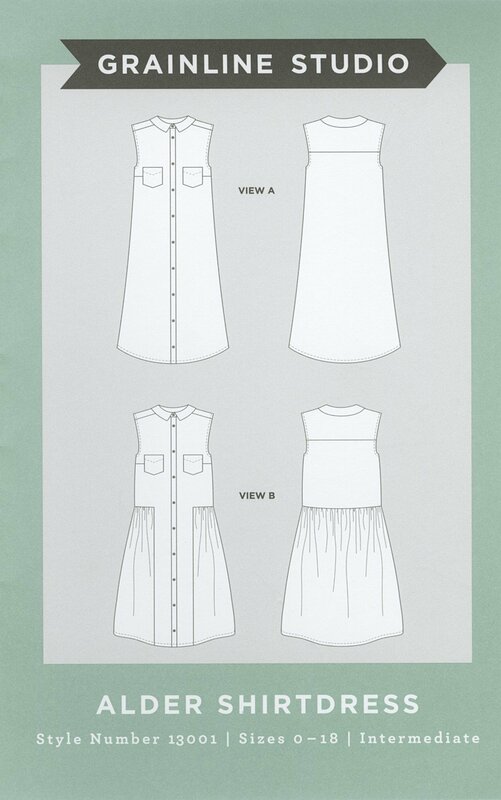 View B features the same bodice as View A but with a gathered skirt at the sides and back of the garment resulting in an incredibly flattering and fun silhouette. The Alder Shirtdress is a perfect breezy option to keep cool while looking great all spring and summer long or throw on a cardigan or blazer and you’re all set for fall and winter! Techniques involved include sewing a straight seam, bust darts, bias facing armholes, adding a shirt collar, gathering, and buttons & buttonholes. Pattern is nested to facilitate cutting between sizes if needed. SUGGESTED FABRICS Light to medium weight fabrics ranging from silk charmeuse, crepe de chine, cotton shirting, poplin, chambray, sateen, lightweight to mid-weight denim, linen, linen blends, and flannel. Extra fabric may be needed to match plaids, stripes, or one-way design prints.